As many of you know, I am a Homes.com girl. I have the privilege of writing for the Homes.com blog twice a month and am honored to be part of such a blogger-friendly company! What I love most about Homes.com is that they truly understand that home is so much more than a building where we reside. They don’t want to just connect you with homes out there for sale; they want to inspire you to create the home of your dreams on ANY budget! And to help you dream big, they are constantly coming up with creative contests and giving away crazy amounts of money. Seriously, what’s not to love? Right now they have two fun contests going on—one on Pinterest and one on Facebook. I’m going to let them explain the details of how you can play along and have a chance at winning some quick cash! Good luck! Hello Home Stories A to Z Readers! As you may have noticed we at Homes.com are in the Halloween spirit. We are big fans of all of the décor, costumes, spooky real estate, entertaining options, and of course all the delicious Halloween treats! In addition to seeing your spooky home décor, we want to see what else inspires you this festive season and what better way than through Pinterest? In case you are unfamiliar with the site, check out our Pinterest blog to learn more. To prove Halloween isn’t just for kids, Homes.com is hosting a Spooky Scavenger Hunt on Pinterest. Step 1: Create a board titled ‘Homes.com Spooky Scavenger Hunt’ on Pinterest. If you’re not already, be sure to follow Homes.com on Pinterest. 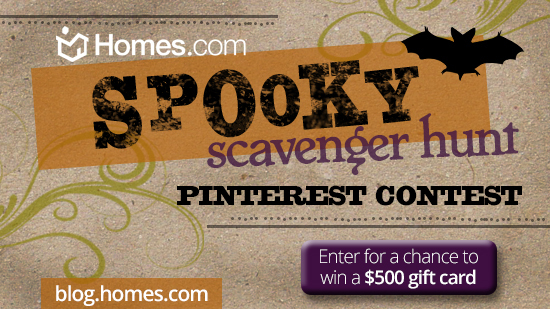 Step 4: Hop on over to Homes.com and provide the link to your Spooky Scavenger Hunt Pinterest board in the comment section OF THIS POST at Homes.com for a chance to win the $500 gift card. Links left in the comments of this blog post are not eligible to win. If you have any questions or would like an invite to Pinterest, please feel free to contact contest@homes.com. Please see the official rules for additional details. Sounds like fun! Just to clarify, when you complete the scavenger hunt you should have a Pinterest board with 16 images on it. In addition to the Pinterest scavenger hunt, Homes.com is also conducting a Spooky Space photo contest. Enter a photo of your Halloween decor for a chance to win a Halloween Party valued at over $1,500! You can click here to enter on Facebook. Thank you Homes.com for being awesome and for inspring us to dream big!